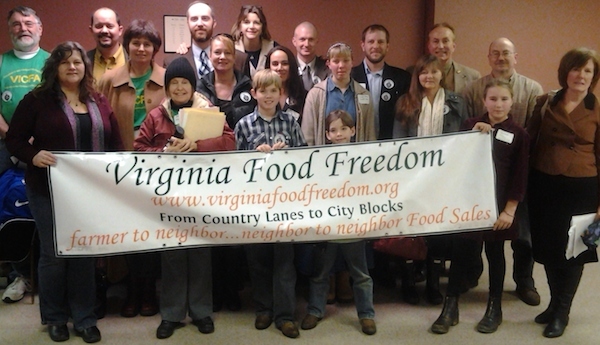 Virginia Food Freedom lost big in Richmond — but they’ll be back to lobby again next year. The bill came up before the House Agriculture Subcommittee February 2, and the meeting was held in a smallish conference room that had standing room only. About half of the non-delegate attendees represented the Virginia Farm Bureau, the Virginia Agribusiness Council, and their supporters. The other half were mostly small farmers who traveled at their own expense to plead their case. Delegate Robert Bell from the 58th District (Charlottesville) introduced the bill. Then it was time for supporters to speak to the committee members. The first speaker was Duane McIntyre who drove six and a half hours from Russell County. He placed cigarettes, honey, alcohol, and meat on the conference room table as examples of commonly sold items that are known to have safety issues. Bernadette Barber spoke about her son’s febrile seizures as a young child and how he recovered by eating raw honey and milk from her own cow. Store owner and a member of the Fauquier County Board of Supervisors Holder Trumbo said he believes that this bill should be passed so that small farmers can keep their expenses to a minimum and make a living. It was clear from the opponents that their concern was the sale of raw milk — even though the bill encompasses more than that. Wearing his white lab coat, Dr. Sam Bartle of the Virginia Chapter of the American Academy of Pediatrics said there were no studies on the health aspects of raw milk (although I found several articles in the PubMed library of medical studies). Other speakers were Dr. Tom Massey of the Virginia Veterinary Medical Association, Lindsay Reams of the Virginia Farm Bureau, Brad Coperhaven of the Virginia Agribusiness Council, and Sam Towell, Deputy Secretary of Agriculture and Forestry, all of whom spoke out against raw milk in particular. Delegate Charles Poindexter moved to table the bill and Delegate Barry Knight seconded. All except 3rd District Delegate Will Morefield voted to table. This was a resounding defeat and it was clear from the absence of questions by the delegates that they had already made up their minds. But there is no question that we’ll be back next year, although I believe that the strategy needs to change. and handled out free samples. He was followed by Joanna Moyer, the nineteen year old artisan cheesemaker from Russell County whom I featured in my last article. This bill was also tabled. Those of us in the audience supporting the Food Freedom bills finished Micah Beachy’s half gallon of raw milk and survived to fight another day. So that’s it for HB1290 for this year. So what’s next on my writing agenda? I am hoping to travel up and down the Eastern Shore of Virginia interviewing and reporting on farmers with small sustainable farms. I’d like to learn more about the farming process and what motivates these men and women to buck the agri-business system for very little financial return. In the process I’ll be refining my Weston A. Price resource list so that people who are interested in eating traditional, real food can find what they need on the Shore. In addition, I’ll be shedding some light on my motivations for spending time writing about food and agriculture and explain the benefits of organic, unadulterated food that is prepared according to traditional methods.